Join renowned watercolorist Bonnie Jones of Orange City, Florida for a two day workshop the weekend of March 24 - 25, 2018. 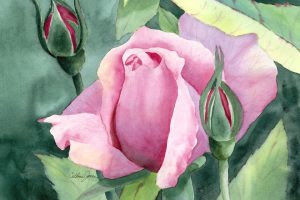 Learn her step by step method and enjoy individual hands-on instruction with the emphasis on finishing a painting each day Bonnie’s workshops are always fun and entertaining, a stress free way to develop new ideas for painting with watercolors. Bonnie’s goal as an artist is to create paintings that make the viewer feel good and reflect her love of nature. She will lure you in with her warm and beautiful colors. She has a busy teaching schedule and we are honored to have her in our area sharing her techniques. The Studios of Cocoa Beach , 165 Minuteman Causeway , Cocoa Beach is a non-profit gallery and the creative hub of downtown Cocoa Beach with a full schedule of workshops in a variety of techniques from beginner to advanced, adults and children. The Studio is openMonday and Tuesday 10:30 am to 3:30 pm, Wednesday through Saturday 10:30 am-8pm and Sunday 11 am-4 pm. For more information on exhibits, Studio artists, or the complete workshop schedule, visit the website: www.studiosofcocoabeach.org or call 321-613-3480.